Which is the “community” of a MOOC like this Rhizo14 ? Is it the union set of all people registered to any of the P2Pu forum, the Facebook, Google+, Diigo and Flickr groups and all who ever blogged or tweeted or retweeted using the hashtag or commented on any of these in any week? This would mean a large number, including rather passive participants who fired a single reaction and then left again, but it would still exclude many who may be eagerly reading, and who may be actively engaging with the discussions in their heads and may be often considering a comment just short of finishing it. and for me, the word has many connotations of a close or narrow grouping, with many senses like religious fold or congregation, or confraternities and comradeships. And even the word senses of formal administrative memberships, like in municipalities, parishes, or alliances and unions, don’t fit well, either, with what is going on in a MOOC, where people loosely gather around some weekly topics. IMHO, this description, fits much better with “network” than with “community”. 8 Responses to MOOC community? It was interesting to read how you defined the concept community. It opened to me the difference between our expertise again. I’ve studied communities for years and I know the roots of the concept in psychology, social psychology and sociology. I never use a dictionary for checking the concepts which I know. That would be wise in MOOCs, I am not sure. When I study “the new science of networks” (for instance Barabasi: Linked) I am quite open for whatever definitions and truths. It is hard to know the basics of that multiscientific presentation. It sounds excellent but my critical mind says that some parts may be rubbish. I have my experiences to compare but they are limited. The question of expertise is open and I don’t know what would be a right direction. I don’t believe Downes’ way to take any concept and define it, so my solution is different from yours. Perhaps we will be wiser some day..
Hi Heli, thank you very much for your open words. If my point came across as a definition, I was not clear enough and sorry about this. Really I was just guessing. If I guess that a community is somehow closer and a network is somehow looser, I hope this is not also wrong to people with expertise (which I am certainly not). 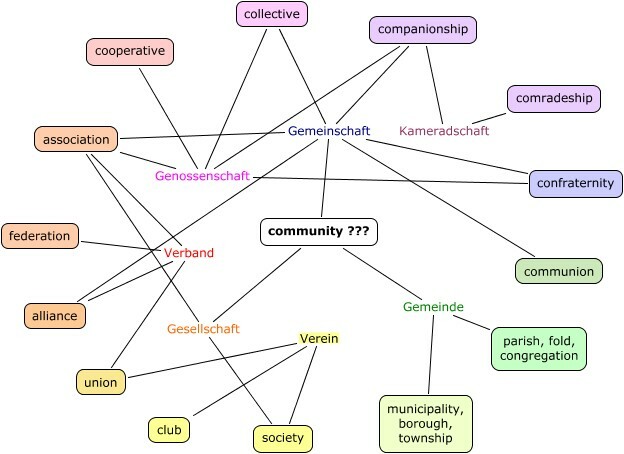 All interpretations of the word ‘community’ that I can think of (including Wenger’s COPs), do not match this MOOC as a whole. There may be parts of it who may indeed feel like a core community, but this subset cannot be identified with, nor extended to, the larger set. And I am not sad about this, because there is still the chance for resonance (e.g. extending beyond the one topic of common interest, towards secondary topics and empathy like, say, Sarah’s storm) that may gradually create a sense of belonging and long-lasting connections. But this does not need group-think. Thanks again for your thoughts and for your visit. I agree with your definition ” a community is somehow closer and a network is somehow looser ” and I liked your post. Perhaps you understood this already, just checking. Yes, I understood this, and I have the same problem with English. And I agree very much how exciting it is when different angles and perspectives from different expertise come together. I have no problem to admit my lacking expertise in pedagogy, because I come from a very different field. I’ve been doing a lot of guessing too…approximations. The same or similar concepts will appear in different fields/disciplines under different names. I think you can usually suss out (figure out, from suspect) the meaning if you aren’t set on an exact match — or it being the one from your field. Even so, two or more people using the same term differently can lead to confusion — friction too — as well as excitement. I’m finding the course energizing and engaging…not sure what I am going to do with it. The perspective re-boot is good enough though. Vanessa, thanks for your visit and for the support. I like the new word that you just taught me; I am not sure if we have a corresponding one. It sounds like it’s suitable for the dynamic negotiation of words in language games.